With many owners looking to build bigger and bigger yachts, we take a look at some of the yachts that are bucking the trend and proving that bigger is not always better. Cost is often the deciding factor when choosing a superyacht. But marina access, draught and intimacy are just some of the other reasons why a superyacht owner may choose to build or buy smaller. 1. Okto At 66 metres, Okto may be the largest yacht to be launched by ISA, but she was built for an experienced owner who was actually looking to downsize from his 82 metre Oceanco, Alfa Nero. When the owner’s rep George Mourkakos spoke to Boat International he explained why: “The owner said to me, ‘George, every time I come on board (Alfa Nero), I see new people, new crew.’ So he wanted the same luxury and quality but in a smaller package.” He got what he wanted — Okto has 17 crew to Alfa Nero’s 28. Okto is also one of the world’s quietest yachts. With many owners looking to build bigger and bigger yachts, we take a look at some of the yachts that are bucking the trend and proving that bigger is not always better. Cost is often the deciding factor when choosing a superyacht. But marina access, draught and intimacy are just some of the other reasons why a superyacht owner may choose to build or buy smaller. 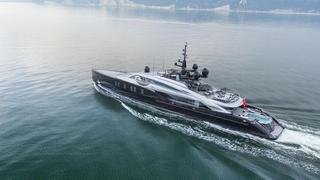 At 66 metres, Okto may be the largest yacht to be launched by ISA, but she was built for an experienced owner who was actually looking to downsize from his 82 metre Oceanco, Alfa Nero. He got what he wanted — Okto has 17 crew to Alfa Nero’s 28. Okto is also one of the world’s quietest yachts. Many superyacht owners and builders look to expand existing platforms to create bigger yachts. Logica Yachts has done the opposite. 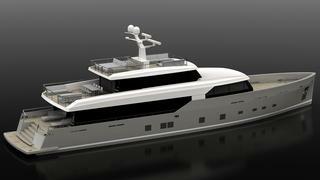 The 35 metre Logica 120 is eight metres smaller than the rule-breaking superyacht Logica 147, but the design packs all of the features of its big sister into a smaller 37 metre yacht. Not only does the Logica 120 come with a smaller price tag than its big sister, it also features the same big boat features and long-range performance. The yard said that a clever design approach has allowed space to be optimised — it combines large windows with a well considered, open-plan layout to make the space feel bigger. Many superyacht owners and builders look to expand existing platforms to create bigger yachts. Logica Yachts has done the opposite. The 35 metre Logica 120 is eight metres smaller than the rule-breaking superyacht Logica 147, but the design packs all of the features of its big sister into a smaller 37 metre yacht. Not only does the Logica 120 come with a smaller price tag than its big sister, it also features the same big boat features and long-range performance. The yard said that a clever design approach has allowed space to be optimised — it combines large windows with a well considered, open-plan layout to make the space feel bigger. The idea for the series of five compact Feadship’s was brought about by the owner of a custom Feadship, who approached the Dutch yard with a particular request. He wanted a custom yacht, built to Feadship standards, but it needed to have a length and draught that would allow access to new markets where mooring facilities are restricted and also facilitate cruising in shallower depths. 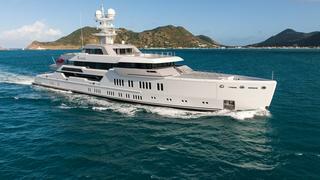 Feadship, along with in-house naval architect De Voogt, was able to deliver on the request, and the first hull, Feadship 692, was launched in February 2016. The idea for the series of five compact Feadship’s was brought about by the owner of a custom Feadship, who approached the Dutch yard with a particular request. He wanted a custom yacht, built to Feadship standards, but it needed to have a length and draught that would allow access to new markets where mooring facilities are restricted and also facilitate cruising in shallower depths. 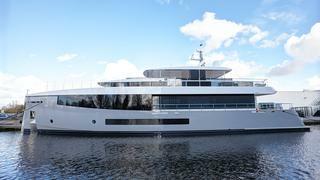 Feadship, along with in-house naval architect De Voogt, was able to deliver on the request, and the first hull, Feadship 692, was launched in February 2016. Lürssen was involved in the construction of four of the top five largest yachts in the world and currently has another five projects over 100 metres under construction. However, with Ester III Lürssen has shown that it's not all about size. The 66 metre, Espen Øino designed yacht is jam-packed with originality in looks, layout and technology. The owners chose to concentrate on design and function rather than on size. Ester III has everything the owner and his family could need, and at 66 metres she has the added bonus of being able to slip into most of the world’s superyacht marinas. Lürssen was involved in the construction of four of the top five largest yachts in the world and currently has another five projects over 100 metres under construction. However, with Ester III Lürssen has shown that it's not all about size. The 66 metre, Espen Øino designed yacht is jam-packed with originality in looks, layout and technology. The owners chose to concentrate on design and function rather than on size. Ester III has everything the owner and his family could need, and at 66 metres she has the added bonus of being able to slip into most of the world’s superyacht marinas. Italian yacht builder Cerri Cantieri Navali rebranded itself last year as CCN and announced a new direction, which includes the Navetta ‘pocket superyacht’. Designer Tommaso Spadolini’s brief from the yard was to design a superyacht that had the spaciousness and comfort normally found on larger yachts but in a smaller package. He came up with the design of the 35 metre Navetta, which has a large skylight to bring light down into the interior. One of the most notable design features is the decision to dedicate the main deck to guest accommodation and push the living area up to the bridge deck. 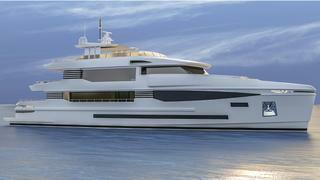 CCN is also offering a smaller 27 metre version. Italian yacht builder Cerri Cantieri Navali rebranded itself last year as CCN and announced a new direction, which includes the Navetta ‘pocket superyacht’. Designer Tommaso Spadolini’s brief from the yard was to design a superyacht that had the spaciousness and comfort normally found on larger yachts but in a smaller package. He came up with the design of the 35 metre Navetta, which has a large skylight to bring light down into the interior. One of the most notable design features is the decision to dedicate the main deck to guest accommodation and push the living area up to the bridge deck. CCN is also offering a smaller 27 metre version.